Hiyoko Imai has been on my radar for about six months or so now, ever since I heard about the collaboration with Tenue de Nimes and London Undercover. She’s a fantastic illustrator and designer who currently resides in Amsterdam, Holland. 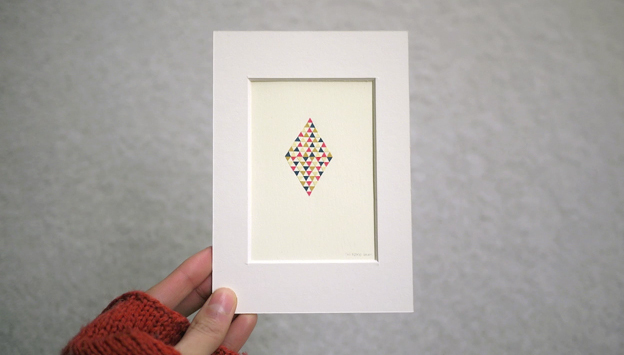 Many of her works involve paper and this specific film below presents her new series ‘mont petit’ which consists of tiny triangles all stacked one on top of each other. Every single piece has been cut and pasted by Hiyoko herself. I have to say, I really enjoy these short videos because they go alongside the ethos of the designer, all of the process is controlled and constraint by Miss Imai. It’s also nice to see the element of craftsmanship and a minimalistic aesthetic. I recommend checking the mont petit shop, where you can purchase exclusive works from Hiyoko. The music in this piece is by lullatone.com.